The Denver Nuggets are in the midst of a magical season that not many saw coming. Denver went into Thursday’s contest on a four-game winning streak and were only one-half game behind the Golden State Warriors for the top overall record in the Western Conference. That was thanks to a 114-105 win over the Boston Celtics in a game that Denver rallied in due to a big fourth quarter to clinch a playoff spot in. This is the first time that the Nuggets have clinched a playoff berth since the 2012-13 season but they have their sights set on a new goal; getting the No. 1 overall seed. The Nuggets went on the road on Thursday against the 11th-seed Washington Wizards, whose playoff hopes are looking slim. Denver was able to get closer to their No. 1 seed goals, defeating the Wizards 113-108 behind a big fourth quarter. Denver survived yet another up and down game that came down to the Nuggets’ second unit stepping up. With that we give you the good, the bad and the ugly. The Nuggets are currently riding a five-game win streak and it is behind the offense that the Nuggets got going on Thursday. Denver enjoyed offense in different ways than they are used to — their bench, specifically — as they outscored Washington’s bench 40-14. The Nuggs’ offense was definitely clicking; eight players scored in double digits. 15 was the number of the night as five of those players are finished with 15 points in the victory. 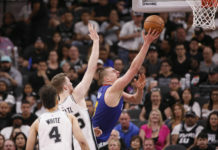 Jokic carried the way with 15 points, 11 rebounds and six assists as most of his work came in the first half. Jamal Murray, Gary Harris, Paul Millsap and Torrey Craig also finished with 15 points to showcase the Nuggets depth throughout the night. All of their contributions helped to give the Wizards different looks all night. 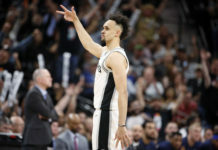 Barton finished with 13 points and four rebounds, and while he did not have a big game as far as production, he did have one of the biggest shots on the night to secure the victory. Mason Plumlee finished with 11 points and six rebounds to give solid minutes off of the bench. Craig was the final double-digit scorer who played well off the bench with 15 points. This is his second straight game of the bench stepped up huge, showcasing why Denver is one of the deepest teams in the league. For as good as the Nuggets were on offense it was a bit of a surprise to see the defense non-existent. 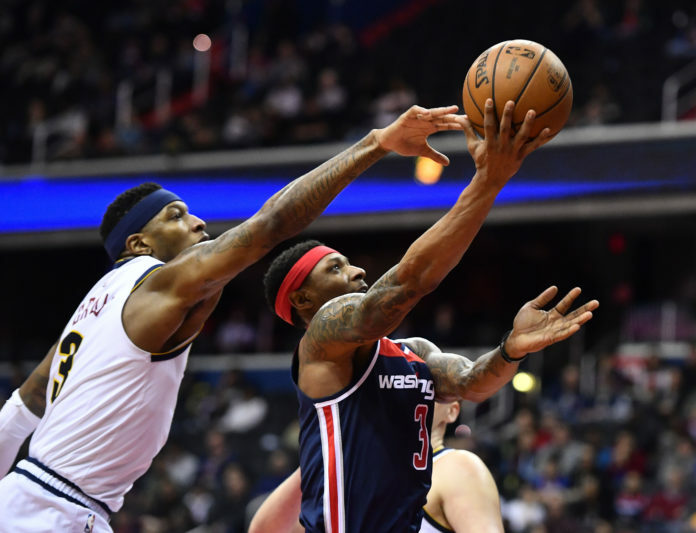 The Wizards were extremely aggressive offensively, looking to run early and often as they went into the half scoring 53 points. The Wizards want to play up and down and go at the opposing team on each possession with that deep outlet pass. They did just that against Denver. Washington controlled the pace early on and had multiple low-scoring players enjoy a solid half. Thomas Bryant went into the break with eight points and he also recorded five rebounds. Bobby Portis also had 12 points and a few of their baskets came off of the two big men just getting down the court faster that the Nuggets bigs. That led to a run in the second quarter as well as Washington having a big third quarter. Malone was not happy with his team’s play on defense and used multiple timeouts to discuss the effort. Simply, the Wizards kept getting behind the Nuggets defense for easy baskets at the rim. Denver, at one point, trailed by as much as eight points but allowed their offense to carry the load and that is why they went into the half with an eight-point lead. In the third quarter Denver went through another defensive low in the game as they allowed the Wizards to go on a 32-11 run. 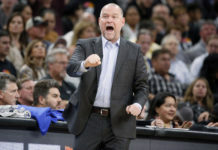 Malone elected to not call a timeout in preparation for the playoffs, seeing how his team would respond. Denver did not finish off the quarter well as they lost the frame 24-32 but Harris and Millsap set the tone on both ends of the floor. That kept Denver in the game to make their move. The schedule makers were not kind to Denver for the final stretch. Denver just played a game which came down to the final quarter on their second of a four-game road stretch and now have a back-to-back. On Friday, the Nuggets are up against the rested New York Knicks who had a day off in Madison Square Garden. Although the Knicks are not a great team, Denver will have to dig deep if they plan on pushing their five-game winning streak to six. Denver has three more back-to-backs with only 11 more games remaining in the season and are fighting for home court advantage throughout the playoffs. It also depends on how Golden State plans to finish the season. Golden State beat Indiana on Thursday night which keeps them ahead of Denver for the time being but the Nuggets are knocking on the door and have a tough schedule to overcome but remain right where they want to be. The next two weeks are going to be interesting.